Background: Support group is a service provided by Pacific Bariatric Surgical Medical Group to its gastric bypass patients before and after surgery. It has already been well established that group therapy helps breast cancer patients survive longer. Methods: 102 patients answered self-report questionnaires that were mailed out in the spring 1998 newsletter. The questionnaire was designed to investigate weight loss, mood, postsurgical problems, and the reasons patients chose not to attend the support group meetings. Results: The mean preoperative weight was 303.65 lb (137.73 kg), with a mean weight loss of 95.79 lb (43.45 kg). The mean desired goal weight was 152.47 lb (69.16 kg), and there was a 63.3% loss of excess weight. The mean elapsed time since surgery was 15.2 months. After surgery, 25.5% of patients reported seeing a mental health professional. There was no difference in mood between group meeting attenders and nonattenders. There was a statistical trend for more weight loss (P = .08) in group attenders than in nonattenders. For group attenders, the more often patients attended group meetings, the more weight they lost (P <.05). Patients with reported emotional, psychosocial, dietary, and lifestyle problems were no more likely to attend group than nonattenders. Conclusions: The mean weight loss was as good as or better than reported in the literature. 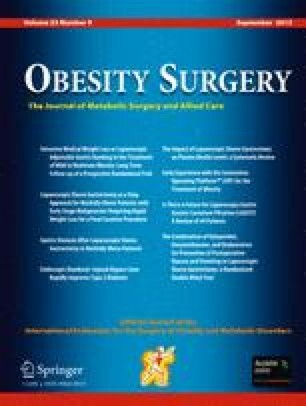 Patients who attended group meetings regularly tended to lose more weight, and increased frequency of attendance was associated with greater weight loss. The implications are discussed.